Naturally Colored Shamrock Shake (Real food) - Oh, The Things We'll Make! 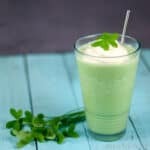 Made from scratch using only natural colors and flavors, this minty shamrock shake is the real food, real deal, perfect for celebrating St. Patrick's Day! What is a Shamrock Shake? 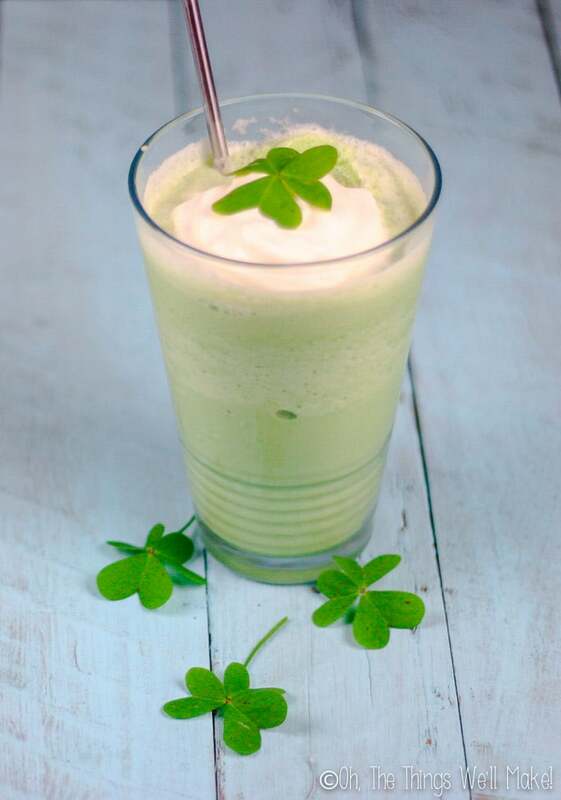 The original shamrock shake is a limited edition mint flavored milkshake that is offered in the US Mc Donald's restaurants each year to celebrate St. Patrick's day. High Fructose Corn Syrup, Corn Syrup, Water, Sugar, Natural Flavor, Xanthan Gum, Citric Acid, Sodium Benzoate (Preservative), Yellow 5, Blue 1. May contain small amounts of other shake flavors served at the restaurant, including egg ingredients when Egg Nog Shakes are available. Shamrock shakes are minty and smooth with a touch of vanilla to them. I have to admit to getting at least one shamrock shake each year around St. Patrick's day when I was growing up, and looking forward to them coming around the next year. I love mint, and couldn't resist the fun of having something “special” to celebrate the holiday. We didn't even really go to Mc Donald's that often, but I would make the special trip to get the shake each year because I loved them so much. It has been years since I've had my last “real” (but not real food) shamrock shake. They don't serve them at the Mc Donald's restaurants here in Spain, so even if I were to want to buy one, I can't. Now, knowing more about the ingredients, I'd probably feel too guilty to be able to drink one anymore anyway. I do admit to missing some of the nostalgia and fun that I associate with them, though. Lucky for me, making a shamrock shake with real food ingredients is actually quite simple. Keep in mind, though, that while this uses natural ingredients, that this still isn't a health food by any means. This is meant to be an occasional treat! Blend the first 5 ingredients together well; these ingredients will be forming the mint ice cream for our shake. I add in the raw (pastured) eggs because not only does it add in protein, but it also helps the texture of the ice cream. If you don't want to use raw eggs, you can eliminate them, or make a custard by heating the eggs with the honey and cream over medium heat. If you decide to make the custard, don't add in the peppermint and spinach quite yet. You can blend them with the milk and ice cream at the blending stage. Taste your mixture and add more honey or peppermint oil or extract, if you like, to suit your taste. I ended up with about 2 cups of liquid. Freeze it overnight to make a mint ice cream of sorts. The next day, cut your ice cream into chunks and blend it with 2 cups of milk (of your choice). You can add in a little ice to make it thicker, and a little less rich, if you like. Taste it, and adjust to your own taste. I added in a few more leaves of spinach to make it a little greener. This shake is naturally colored with spinach leaves. Using spinach to color the shake definitely is healthier than using yellow 5 and blue 1, but you may be thinking that spinach in a sweet shake is going to taste bad. But, if you've never tried it, don't knock it until you have! It's really almost impossible to tell that you've added the spinach at all if it weren't for the change in color. You want to use fresh, raw spinach here! I had originally tried to boil some spinach in water to obtain a natural green food coloring, but my efforts were unsuccessful. The resulting green colored water wasn't concentrated enough for using in recipes, and by boiling the spinach, the beautiful bright green was transformed into a yucky brownish green color. Not very appealing! I have since found a way to obtain a homemade food coloring to a certain extent. If you are looking for a way to make natural food colorings from spinach, though, check out my post on extracting natural colorants (in the link above). There are several ways to obtain the minty goodness of a shamrock shake. I originally made this recipe only using essential oils, but I realized that a lot of people are opposed to using essential oils in this way. Not only do a lot of people avoid ingesting essential oils at all, peppermint is amongst the essential oils that you're supposed to avoid, or at least use with extreme caution, in young children. If you want to add a touch of vanilla, just as the original recipe uses reduced fat vanilla ice cream, why not add a dash of a homemade pure vanilla extract? Which version of the shamrock shake do I like better? I think this version beats the gummed up, artificially colored version any day! Most people here in Spain have never even heard of St. Patrick's day! That said, there are plenty of Brits here and many of them do celebrate the holiday. In fact, there's an English bar in town that happens to celebrate it every year. Here in the Valencian region, St. Patrick's day always falls during the week that we are celebrating our fallas festival. That means that this time of year I will likely be showing you some interesting Spanish holiday fun too. Hopefully you will enjoy both. 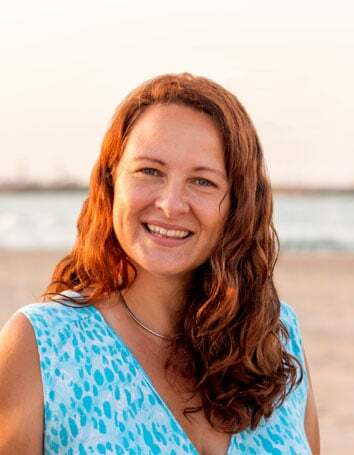 Note on using essential oils for flavoring: Keep in mind that you should do your own research when it comes to using essential oils, particularly when children will be using/consuming them. Many people are opposed to ever ingesting essential oils, but here in Europe they tend to be used more freely in that way. Peppermint is one of those essential oils that has a warning to not use with young children, though, as it may cause respiratory issues with some of them. I have used a food grade essential oil when adding oils to this recipe. Make sure that you choose a trustworthy brand meant for consumption when using them in this way. Also, be conscious of the amount of essential oils that you are consuming at once.